For other people named "Robert McClure", see Robert McClure (disambiguation). Sir Robert John Le Mesurier McClure CB (28 January 1807 – 17 October 1873) was an Irish explorer of the Arctic who in 1854 traversed the Northwest Passage by boat and sledge and was the first to circumnavigate the Americas. He was born in Wexford, Ireland. His father had passed away by the time of McClure's birth. He was a first cousin of Oscar Wilde and spent his childhood under the care of his godfather, John Le Mesurier, governor of Alderney, by whom he was educated for the army. The McClures are of Highland Scots ancestry, a sept of Clan MacLeod of Harris. He entered the Royal Navy in 1824, and twelve years later gained his first experience of Arctic exploration as mate of HMS Terror on an expedition commanded by Captain George Back. On his return he obtained his commission as lieutenant, and from 1838 to 1839, served on the Canadian lakes, subsequently attached to the North American and West Indian naval stations where he remained until 1846. Two years later, in 1848, he joined a search expedition in their attempt to recovery Franklin's lost expedition, an ill-fated expedition to traverse the Northwest Passage led by Sir John Franklin that was missing since 1845. McClure served under James Clark Ross as first HMS Enterprise's first lieutenant. After he returned from the first Franklin search expedition, a new search expedition was launched in 1850, commanded by Richard Collinson on HMS Enterprise and McClure as his subordinate, given command of HMS Investigator. The ships sailed south on the Atlantic, navigated through the Strait of Magellan to the Pacific Ocean assisted by the steam-sloop HMS Gorgon. Collinson and McClure became separated and had no further contact for the rest of their respective journeys. Investigator sailed north through the Pacific and entered the Arctic Ocean by way of Bering Strait, and sailing eastward past Point Barrow, Alaska, to eventually link up with another British expedition from the northwest. 'Investigator was abandoned to the pack ice in the spring of 1853. McClure and his crew undertook a sledge journey and were rescued when they happened upon a party from HMS Resolute—one of the ships commanded by Sir Edward Belcher, who sailed into the Arctic region from the east. Subsequently, he completed his journey across the Northwest Passage. Resolute itself did not make it out of the Arctic that year; it was abandoned in ice, but later recovered. Thus, McClure and his crew were the first both to circumnavigate the Americas, and to transit the Northwest Passage—considerable feats at that time. Enterprise returned to Point Barrow in 1850, a fortnight later than Investigator, and found the passage blocked by winter ice. They had to turn back and return the following year; it conducted its own Arctic explorations, but credit for the Northwest Passage already belonged to McClure. On his return to England, in 1854, McClure was court martialed for the loss of Investigator. This was automatic when a captain lost his ship. Following an honourable acquittal, McClure was knighted and promoted to post-rank, his commission being dated back four years in recognition of his special services. McClure and his crew shared a monetary reward of £10,000 by the British Parliament. McClure was also honoured by English and French geographical societies. In 1855, he was elected a member of the American Antiquarian Society. From 1856 to 1861 he served in eastern waters, commanding a division of the Naval Brigade before Canton in 1858, for which he received the Order of the Bath. His latter years were spent in a quiet country life; he attained the rank of rear-admiral in 1867, and became a vice-admiral in 1873. He died later that year and is buried at Kensal Green Cemetery, London. McClure Strait was later named after him, as well as the lunar McClure crater. ^ Lee, Sidney, ed. (1893). "McClure, Robert John Le Mesurier" . Dictionary of National Biography. 35. London: Smith, Elder & Co. pp. 4–5. Osborn, S., ed. (1856). The Discovery of the North-West Passage. Longman, Brown, Green, Longmans, & Roberts. "McClure, Sir Robert". Dictionary of Canadian Biography (online ed.). University of Toronto Press. 1979–2016. "McClure, Robert John Le Mesurier". A Naval Biographical Dictionary – via Wikisource. Chisholm, Hugh, ed. (1911). "McClure, Sir Robert John le Mesurier" . Encyclopædia Britannica (11th ed.). Cambridge University Press. HMS Resolute was a mid-19th-century barque-rigged ship of the British Royal Navy, specially outfitted for Arctic exploration. Resolute became trapped in the ice and was abandoned in 1854. Recovered by an American whaler, she was returned to Queen Victoria in 1856. 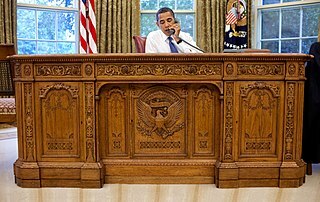 Timbers from the ship were later used to construct a desk which was presented to the President of the United States and is currently located in the White House Oval Office. Admiral Sir Edward Belcher was a British naval officer, hydrographer, and explorer. Born in Nova Scotia, he was the great-grandson of Governor Jonathan Belcher. He was briefly married to Diana Jolliffe, stepdaughter of Captain Peter Heywood, that marriage ending upon her application for legal separation for his having infected her with venereal disease. Vice Admiral Sir Horatio Thomas Austin was a British Royal Navy officer and explorer. Sherard Osborn, was a Royal Navy admiral and Arctic explorer. Captain Francis Rawdon Moira Crozier officer of the Royal Navy and polar explorer who participated in six expeditions to the Arctic and Antarctic. In May 1845, he commanded HMS Terror on Franklin's expedition to discover the Northwest Passage, together with HMS Erebus and under overall command of Sir John Franklin. They were never heard from again and the entire expedition perished, a total of 129 men. Sir Richard Collinson was an English naval officer and explorer of the Northwest Passage. Vice Admiral Sir Henry Kellett was a British naval officer and explorer. 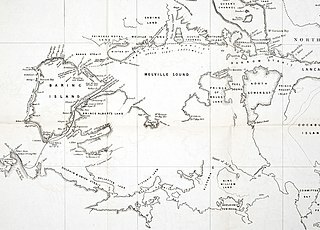 The McClure Arctic Expedition of 1850, among numerous British search efforts to determine the fate of the Franklin's lost expedition, is distinguished as the voyage during which Robert McClure became the first person to confirm and transit the Northwest Passage by a combination of sea travel and sledging. McClure and his crew spent three years locked in the pack ice aboard HMS Investigator before abandoning it and making their escape across the ice. Rescued by HMS Resolute, which was itself later lost to the ice, McClure returned to England in 1854, where he was knighted and rewarded for completing the passage.